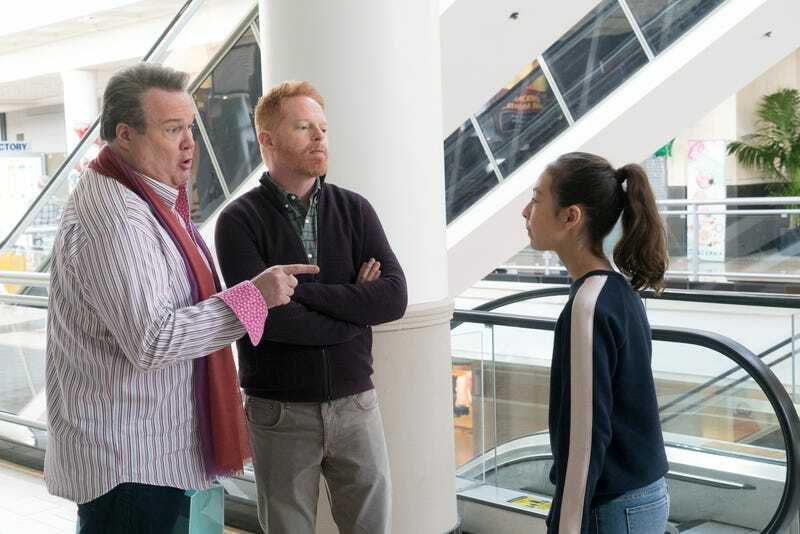 The last few episodes of Modern Family have largely succeeded because of some sort of theme connecting all the stories. Many of the episodes are, as is typical for the sitcom, steeped in chaos and misunderstanding. One secret or lie or misconstrued moment leads to another and then another, before everything unravels. Having thematic connective tissue keeps the chaos grounded, and allows the episode to feel a little less contrived. The idea is that the episodes aren’t constructed simply for punchlines, but rather to tell a larger story, however disjointed it may be. 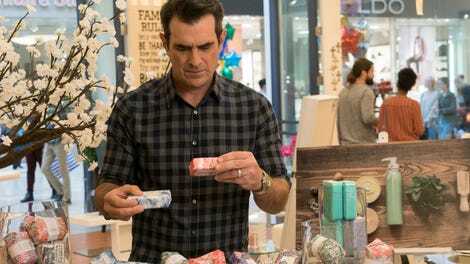 Modern Family doesn’t always pull off the balance, but a few episodes of late have managed to do so, and it’s lead to the strongest stretch of the season. That stretch had to end at some point, and “Daddy Issues” does the trick. It’s certainly not the worst episode we’ve seen in these later seasons, as Modern Family becomes a shell of its former self, but it’s a busy one that never quite finds its focus. This is an episode stuffed with lies, secrets, and misunderstandings, but there’s no connective tissue. Worse than that, there’s very few laughs. What’s strange is that on paper the stories seem promising. There’s potential in the idea of Gloria pranking Jay and Manny, and in Claire finally crafting a more romantic anniversary than Phil. That’s a welcome subversion of character, and yet the show mostly fails to execute on that promise. The cold open acts as a microcosm of everything that’s wrong with “Daddy Issues.” There’s no room to breathe in the opening scene, as the episode rapidly shifts from one “joke” to the next, and the result is some serious whiplash. Before the opening credits there’s a ton of setup. Claire and Phil’s anniversary has arrived, and this time around Phil has left his shopping until the last minute, and Claire is secure in her gift. Luke enters the scene, along with Joe, and we get something about Joe wanting to play a zombie video game, a strange aside that never goes anywhere. Haley comes into the scene as well, panicking about leaving her phone at her boss’ house, and misunderstanding Claire and Phil’s idea to use Joe to get inside. With characters popping in and out of the scene, it’s difficult to track what’s important, or what’s meant to be conveyed. Is it a single set piece? Is it meant to set up the rest of the episode? The answer is: a bit of both, and that’s the problem. “Daddy Issues” is never really sure what it’s trying to do, so the balance between chaotic comedy that lands and chaotic comedy that feels unstructured is all off. Chaos needs something to ground it, be it character motivation, some more emotional drama, or even a simplicity to the storytelling. “Daddy Issues” doesn’t contain any of those things, and as the episode rolls on, it really struggles to pull all of its disparate stories together and leave them neat and tidy. That doesn’t mean “Daddy Issues” is a complete disaster. There’s still some interesting aspects to just about every subplot here, it’s just that they never really clarify in a way that feels either funny or emotionally meaningful. If you’ve been reading these reviews for awhile, you know I’m a sucker for the more emotionally revelatory storylines that allow the characters even the slightest bit of growth, and so the best part of this episode by far is Cam and Mitchell’s struggles with Lily. Their story is still overstuffed with gags, but for the most part the jokes and the revelations land. Their story begins with Lily “pranking” them by putting a bra in a shopping bag, making it look like Cam was stealing from a store. It turns out that Lily’s being picked on at school for not having a bra, and this was her awkward but totally understandable way of trying to get one. When Cam and Mitchell meet with Lily’s teacher to discuss the issue, they go through all sorts of feelings. They realize Lily is growing up, and also that she may have questions about things that they simply can’t answer. Their insecurity over that manifests itself in a hilarious way, as they keep trying to predict the advice the teacher is about to give them, only to be way off base. The comedic timing is spot-on, and it makes the late-episode resolution, where Cam and Mitchell help Lily’s friend get the attention of a boy via text, all the more satisfying. Phil and Claire’s story has its own fun resolution, but the build-up never really gains any momentum. Similarly, Gloria pranking Jay and Manny with a fake ex-boyfriend, who she plays up as a potential paternal father for Manny, falls flat. There’s just very little sense of pacing and timing in each story; even a classic Phil and Claire disaster can’t redeem the otherwise rambling plot. When you can’t even rely on a coordinated disaster to save an episode, there’s really no hope. Another good bit from Cam and Mitchell: failing to punish Lily because they have too many social events and vacations to attend. Are Jay, Gloria, and Manny the most consistently disappointing group of characters on this show? These later seasons have certainly been hit and miss overall, but I really struggle to remember the plots they’re involved in. Phil’s terrible mop gift fixing everything was the perfect way to cap off an otherwise boring storyline.